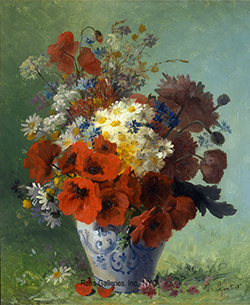 Artists of the 19th century continued the long tradition of still life painting and many made it a life long study. By the latter half of the century some of the major Impressionist painters like Monet, Renoir and Cézanne made it an integral part of their work and in the case of Fantin-Latour it was truly a life long study. Many other artists also devoted their artistic careers to still life painting – these included: Georges Jeannin, Eugene Claude, Madeleine Lamaire, Eugene H. Cauchois, Paul Biva and Clement Gontier. Like his contemporaries, Gontier’s work was greatly influenced by the Impressionists, often capturing the softness and beauty of his subject with robust brushwork and a colorful palette. Gontier was born in Lavaur and received his training in the atelier of Jean Paul Laurens (1838-1921) the French genre and history painter. Gontier specializes in still life and genre scenes and earned himself a third class medal at the Salon in 1904.